Price is an important indicator. But it can also be misleading in many cases. In many of my discussions with my friends about cryptocurrencies, I tell them why comparing the prices of two different cryptocurrencies is wrong. Most of the people don’t get it right away. 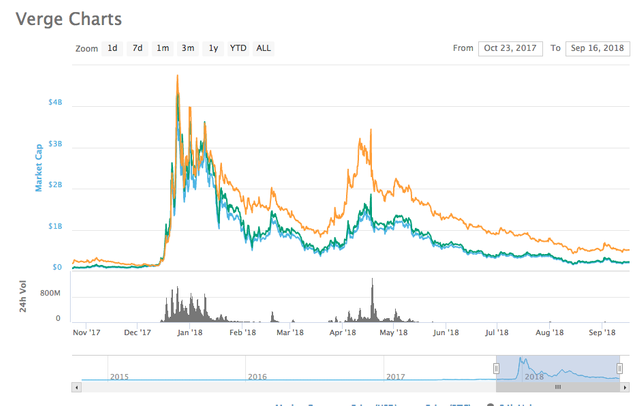 I was and am still surprised to find out that even people who have invested for more than 3 years fail to see the issue with comparing with the prices of two different cryptocurrencies. If you don’t have time to read full article just remember. Don’t compare the prices of two cryptocurrencies. Compare Market Caps or Normalised Prices. Use https://dashboards.bitfolio.org/#/normalised-price to get normalised prices. If you have time and want to know the details go and and read further. 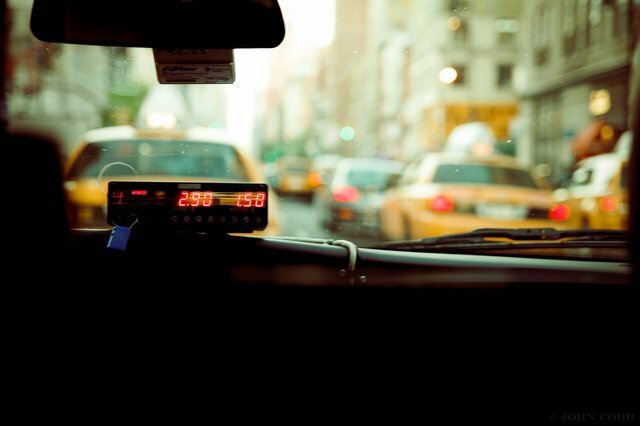 While it is difficult to make sense of the issue with comparing the prices in finance or cryptocurrencies, it is very easy when you take a real work analogy. Lets us assume that I tell you this. 5 kilograms weighs lesser than 50 grams, as 5 is less than 50. I am pretty sure that you will quickly realise the fallacy and call me an idiot. Reason? I am not using the same standard unit for comparison. Simple right? Yes. Using the same unit forms the basis of any comparison. Remember the statement “Comparing Apples to Oranges”. Yet we fail to see the same issues while comparing cryptocurrency prices. We have all seen this screen multiple times. 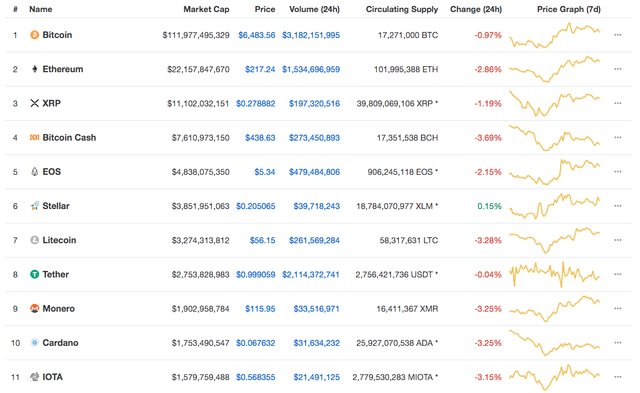 CMC lists the coins based on their Market Caps. Have you asked yourself why? Market Cap is a metric of how much the market values your cryptocurrency. It may not be the ideal metric but it is still the best metric because it means, so many people have bought into your company or your dream. Real skin in the game. Your Game. Your cryptocurrency is successful, people make money. Your project fails, people loose their hard earned money. How much money people loose or make in the process is the difference in the Market Cap of your cryptocurrency over the time. So in an ideal world the price of cryptocurrency shouldn’t matter at all. It is the Market Cap that matters. So thought Cardano is priced at 0.06 USD, its market cap is 1,753,490,547 as it has a huge supply of 25,927,070,538. Bitcoin went from 10$ to 20,000$ in X years. Do your regret missing to invest in Bitcoin? Don’t worry coin XYZ is just 10 cents now. Invest now. This is a classic case of projects targeting people who don’t understand Market Caps and only look at prices. They have an easy trick create a coin with very high supply. Reach out to the insecurities of people with pitch like the above one. Even if the price movement is very small they get to make millions as the market cap shoots up due to huge supply. I don’t have money to buy Bitcoin, it is very costly. The price of Bitcoin doesn’t matter. If you think it has potential to grow you can buy Bitcoin. If you have only 100 USD it doesn’t matter. You can buy 100 USD worth of Bitcoin. There is no rule that you should buy a minimum of 1 Bitcoin. Remember that at max only 21 million people can own 1 Bitcoin as that is the maximum supply. There will be millions more who will be owning only partial Bitcoin. Can you suggest some coins below 1 USD for me to invest in. Again the price doesn’t matter. I can create a cryptocurrency with 2 trillion circulating supply. Even if the price of my cryptocurrency is around 1 cent it will have Market Cap of more than that of Bitcoin. So it is really foolish to look for coins below 1 USD. But again don’t underestimate the ingenuity/stupidity of the masses. There are many people who are actually taking advantage of the gullible people who don’t understand the concept of Market Cap. Verge getting pumped up after being recommended by McAfee was a popular story of the year 2017. It went from 1 cent to more than 20 cents at its peak. These two tweets tell a lot about prices, Market Caps and human psychology. You’re missing an important aspect of human nature. Some brilliant fucker once figured out that people will buy cheap irrespective of value, and perception of a deal is everything. Verge price did shoot up after Mcafee’s tweet proving his hypothesis right. At-least for a short duration, as the price of verge has now fallen back to 1 cent range. 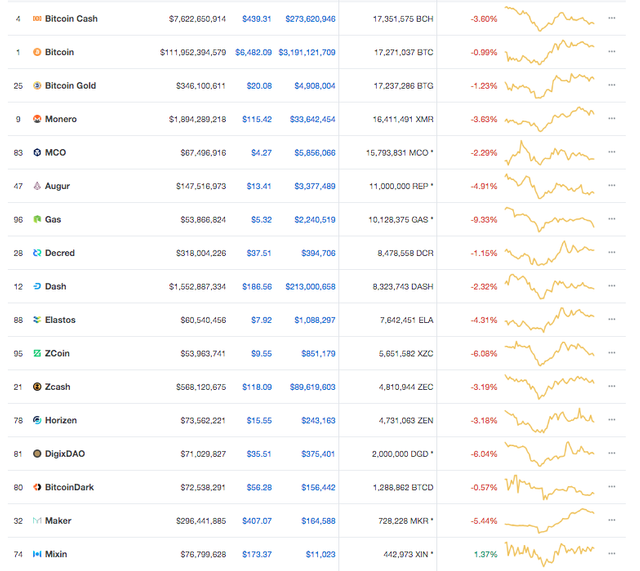 Majority of the coins outside Top 100 are scams or overvalued. So let us just take the top 100 cryptocurrencies. 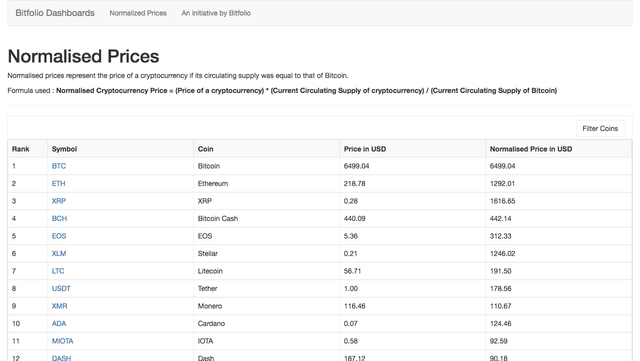 Click on Circulating Supply to sort the list in descending order of Circulating Supply. You can quickly find out that many of the projects that had fan boy clubs where the fans were promising insane returns all fall into the category of “High supply, Low price”. Similarly if you checkout the bottom of the same table you will realise that there are only 15 cryptocurrencies in the Top 100 which have circulating supply less than that of Bitcoin. 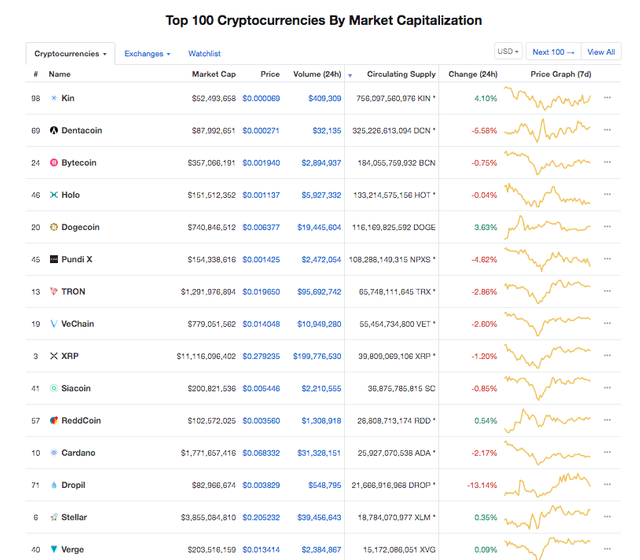 While market cap is a better indicator to compare different cryptocurrencies it is very difficult to use in general conversations. Human brain finds it difficult to comprehend bigger numbers. Comparing the markets caps in terms of billions and millions can be a little daunting. And more over once you are used to something it is very difficult to change the behaviour. Since everybody who is active in cryptocurrency circles are used to the price of Bitcoin, it is better to derive a normalised price which can be easily compared to the price of Bitcoin on any given day. That they still feel at home. Let us try to find out the normalised price for Ether. 218.64 * 101996560/ 17271050 = 1291.20 USD. The only way to make sure that there are less market manipulations is by educating. I am hoping that with this tool more people will start looking at normalised prices and know when they are buying into the hype. I strongly believe that Capital moving to the high impact projects can solve all of humanity’s problems over the time. I am hoping that this new metric finds adoption and helps in correct comparison of cryptocurrency projects which will facilitate channeling of funds to best projects. If you found this post helpful don’t forget to upvote and resteemit. Most novice investors look, in principle, only at a price. They do not understand that with investments one must look at capitalization. He can buy a coin of $ 0.01 with a capitalization of 20 billion, and I'll buy a $ 100 coin with a capitalization of 20 million. However, I can get 100-times profit almost no risk. And beginners can get 2 or 3 times profit with a risk of 90%. This is called the correct ratio of risk and profit. This is what the guru of the financial market teaches us. I believe that before any new investor should be brought to the fact that the profit is measured not in how much the price can grow, but in how much capitalization can grow. Yes I found this out around about a year ago, I mainly use market caps for comparison as this is a bigger indicator of when a project is performing well.